This time of year, there is so much to be done…shopping, traveling, gift-giving…and of course, baking. Baking is one of my favorite past-times, and I do a lot of it, especially during the holidays. Cupcakes, cookies, brownies, breads…You name it, I’ve probably baked it. My friends and family love my baking…But I’ve been keeping a secret. A secret that only a few people know about, that just became easier not to mention because of preconceived notions. There have been times when saying the word vegan in front of people has felt equivalent to Harry openly saying the name Voldemort. 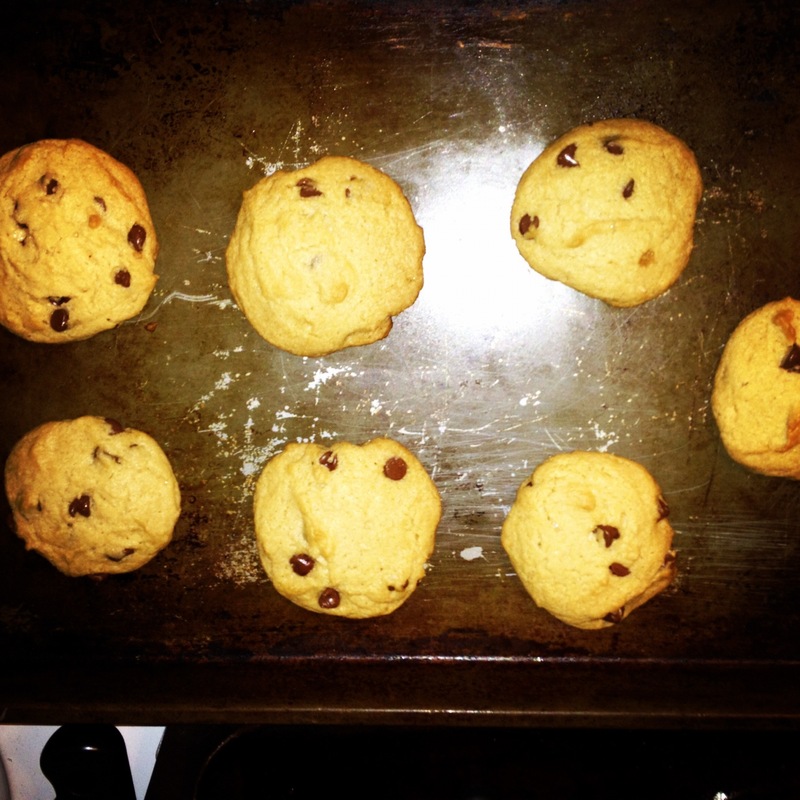 Instead, I’ve used the phrase, “Dairy-free” to describe my baked goods…if anything at all. I do get it; the unknown can be scary. And don’t get me wrong, I’ve tasted plenty of vegan baked goods that left much to be desired. But when done the right way, deliciousness results. So rather than keeping everyone in the dark, I’m going to shed light on my baking practices. You may be surprised by how easy it is and want to give it a try yourself! 1. It’s easy to “veganize” any recipe. For the most part, you’ll just be replacing the butter and eggs. Earth Balance is the best alternative to butter, it’s a margarine that uses non-hydrogenated oil. 2. Depending on what you are baking, there are several options for egg replacements. Cakes and breads are the easiest, because you can just use bananas or (my preference) applesauce, which makes for an extremely moist, delicious cake. 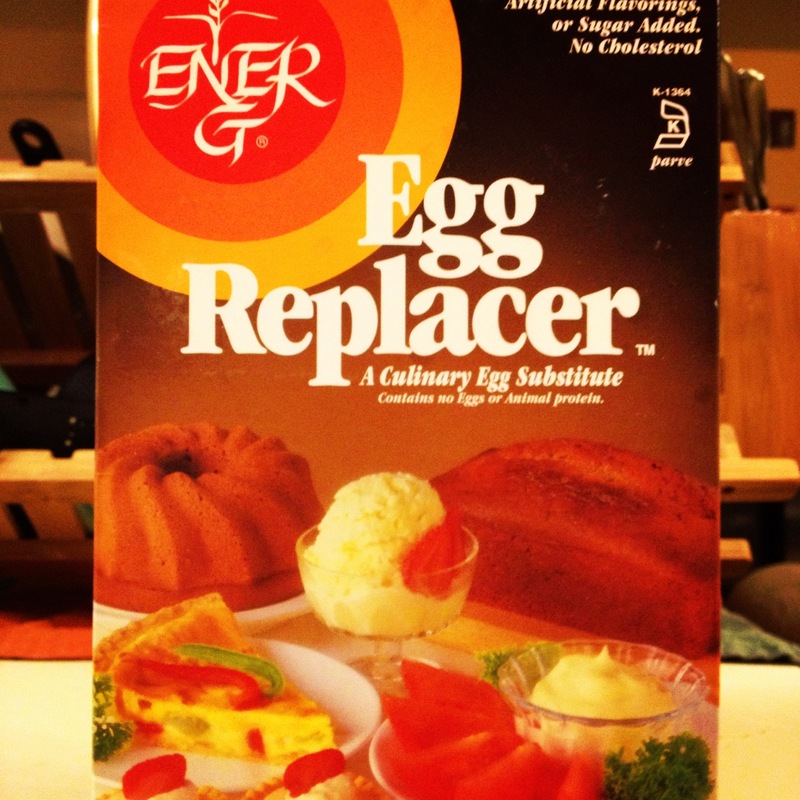 For cookies and brownies, there is a miracle product called Ener-G Egg Replacer. It is a powder that, when mixed with water, turns the consistency of an egg white. It’s sole purpose is for binding, you wouldn’t fry it up in a pan to eat like an egg. But the results in baking are fantastic. It can be manipulated in all kinds of ways, depending on the kind of eggs needed in the baking (i.e., egg whites or yolks instead of whole eggs). Decked in an amazing 70s design, this box is the secret weapon to Vegan Baking. 3. Using egg replacer is also wallet-friendly. Rather than having to buy eggs each time you decide to bake, you can keep this box in your cabinet forever for under $5. Depending on how much baking you do, it can last well over a year. 4. For recipes calling for milk, there are a number of options: soy, rice or almond milk. “Buttermilk” can be made by adding apple cider vinegar to a milk alternative to create a curdled effect. 5. An even bigger bonus of baking egg-free? 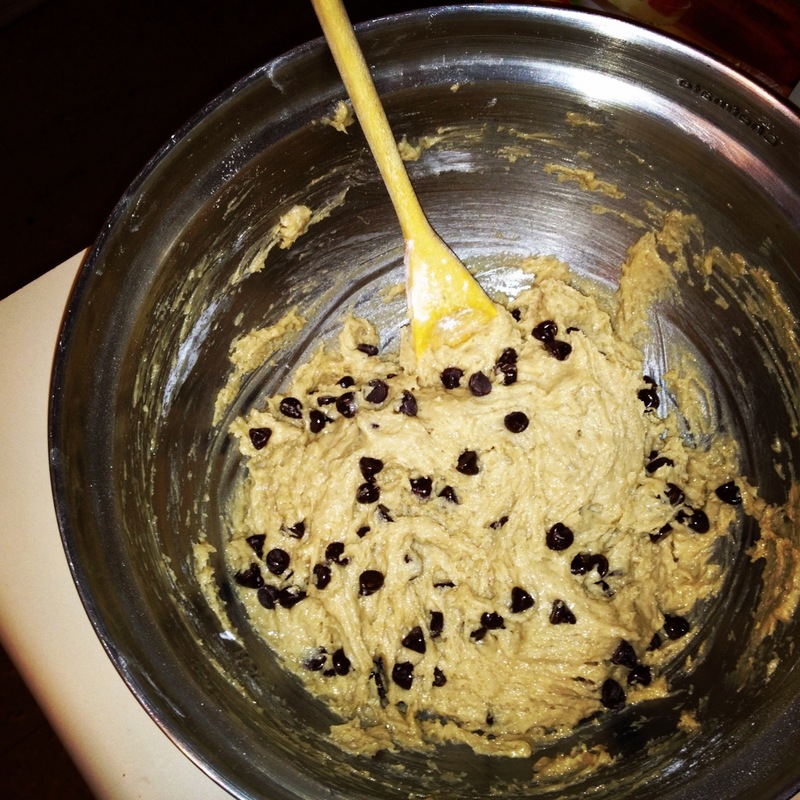 You can eat the dough without worries of salmonella making you sick! And trust me…it’s just as delicious. Not to mention the health factor that less eggs and butter gives these recipes. Now that you’ve got the basics, I’ll share my favorite chocolate chip cookie recipe. I gave a container of them to my mom last week, and my dad only managed to get one before they were gone. That said, if you have your own favorite recipe, try veganizing it! 2. In a small bowl, mix together the dry ingredients (flour, salt, baking soda). Set aside. 3. In a larger mixing bowl, cream together the Earth Balance and both sugars until well incorporated. Stir in vanilla extract. 4. Add egg replacer about one egg at a time, mixing well after each. 5. Slowly begin to stir in the dry ingredients until just incorporated-don’t over-stir. 6. Add in the chocolate chips and nuts (if desired). 7. Drop tablespoons of dough onto an ungreased cookie sheet and bake for 9 minutes. 8. Let sit for about 5 minutes before transferring to a cooling rack. They may be missing eggs and butter, but they are definitely not missing delicious flavor!